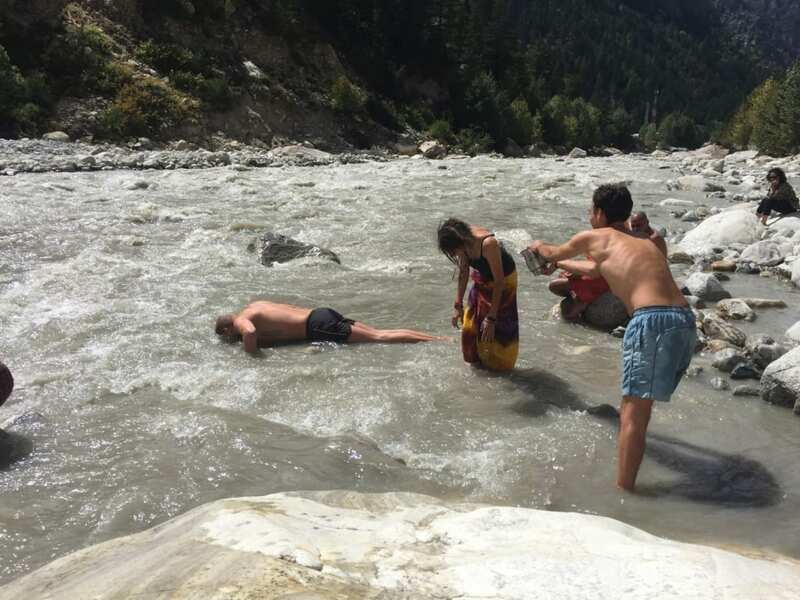 Who knew that being plunged into icy waters could produce the same effect as meditating in a cave? It was a bizarre and beautiful scene. 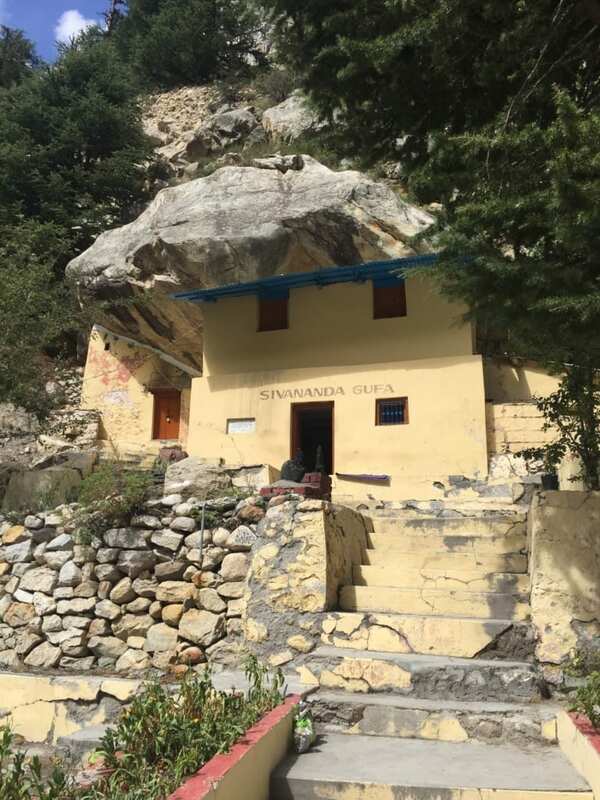 We slipped and scrambled over rooftops, through small yards; thirty or so of us following our guide to the home-in-a-cave of Swami Vishnudevananda*. The scattering of pine needles and the strong scent of cedar wood gave added texture to our journey. Like chattering children we paused to touch, collect and smell without rushing. As soon as we saw it we stopped. Stopped talking, stopped moving. It wasn’t the eyes that needed to adjust – the impact was coming from somewhere else entirely. 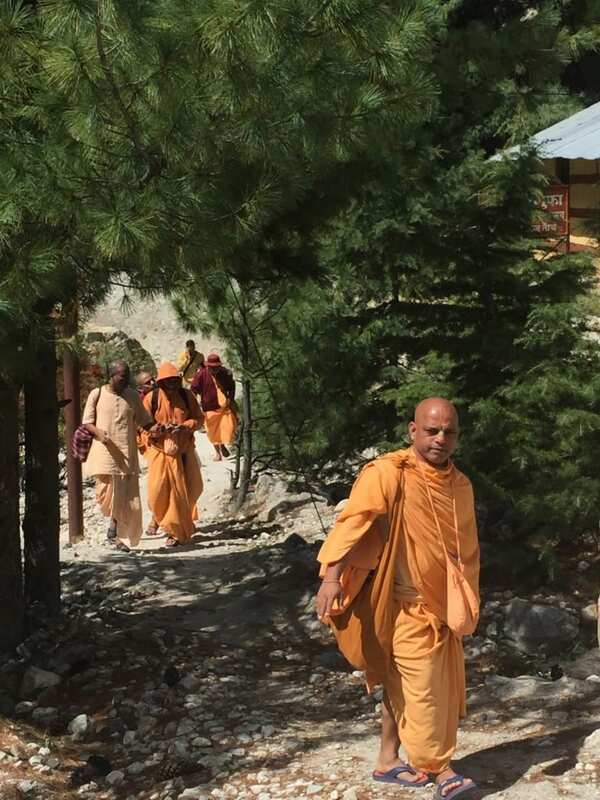 Our teachers and peers in saffron robes on the pathway to so much. One by one we curled ourselves into the dark cave perched on the banks of the Ganges and found patches of cold ground to sit on. Ceiling heights have always been an issue for me and I managed to wrap my limbs in with just one meeting of a beam to my head. We were guided into a meditation of maybe 45 minutes. Denied the visual stimulation of our surroundings and scents or airflow, the usual struggles to stop the mind from veering off course came without effort here. After a small talk from our guides we made our way back out into the thin air of the highest Himalayas. From the light of a single candle inside the darkness of the cave, we were dazzled by the bright September sunshine that greeted us outside. As our eyes, ears and even our skin slowly adjusted to the scene, its sounds and the gentle breeze, we were able to truly unfold into this postcard-perfect scene. Beauty was the only word that rested in my head. I felt expansive, free of limitation. I was connected, somehow, to the sway of the trees and the babbling waters below. I had the strongest sense that my group were all experiencing the same feelings. Our teacher, Robert Moses, who studied underneath Swami Vishnudevananda for many years, giving us a talk on the relevance of the gufa and importance of meditation. 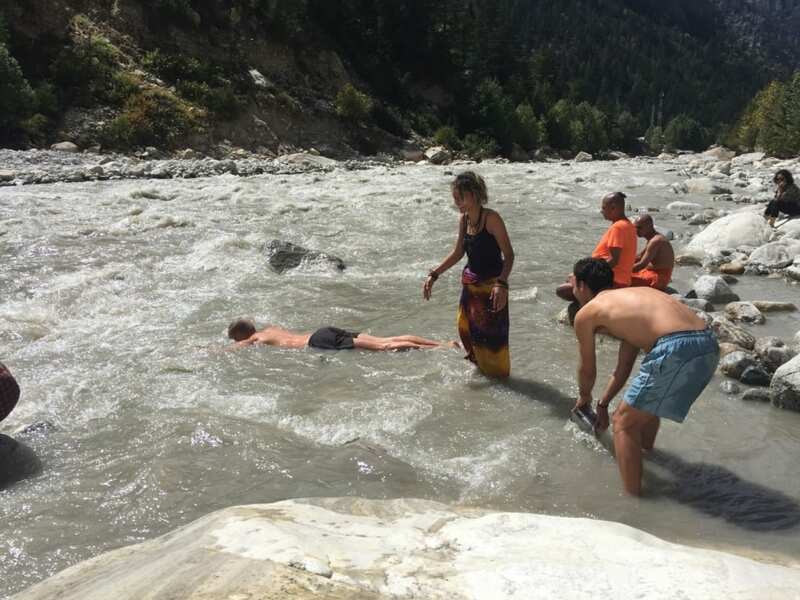 We were offered the chance to dip ourselves in the very waters of the Ganges. If there was ever a time and place, it was here and now. Unlike further down the river, the water here was direct from the glacial source that feeds the mighty river. 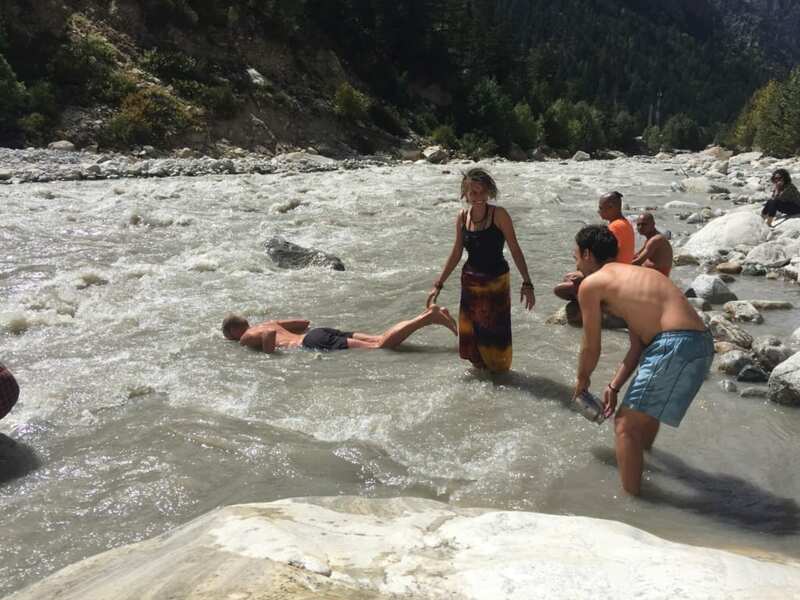 We stripped down to our shorts, and walked into the shallow and freezing water. It took some of the group longer, but eventually we coaxed each other in. I couldn’t have imagined that plunging myself into water of this temperature could take me to the same place that the meditation a short time ago did. There was a complete withdrawal. As the blood pulled back to the internal organs, so too did the senses. All we were left with was a supreme focus. Ice, ice, baby. BRRRHHHH: A few of my fellow students. Once we’d dried off and before we started to make our way back along our path, I paused to take in the view of the cave. It served as a retreat to a man who was one of the few Indians that brought yoga to the west. 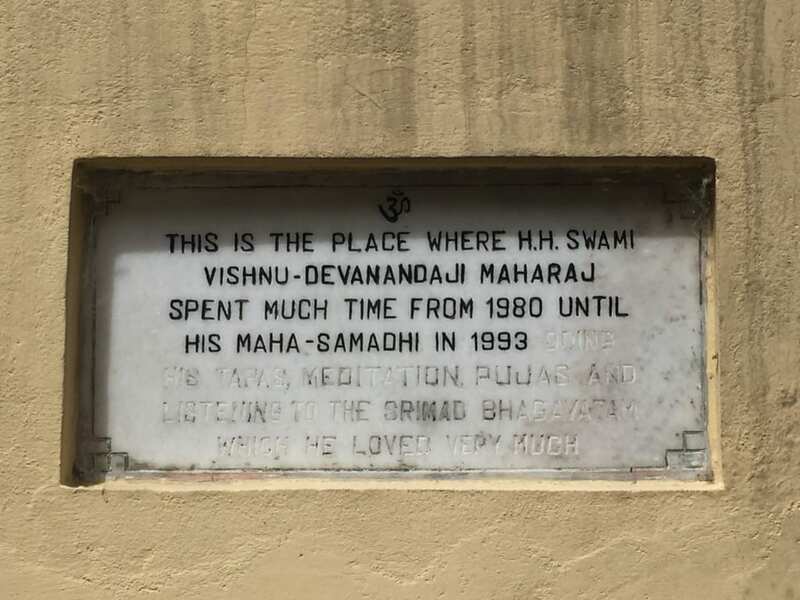 He came here for months on end to meditate, to retreat from the world and by being in nature, connecting with himself in a most profound way. He also came here when he knew it was time to leave his body. When I have struggled with maybe even five minutes of meditation, I have thought of this wise man spending an infinite amount of time here. The lesson is that anything is possible, and with practice it always gets easier. 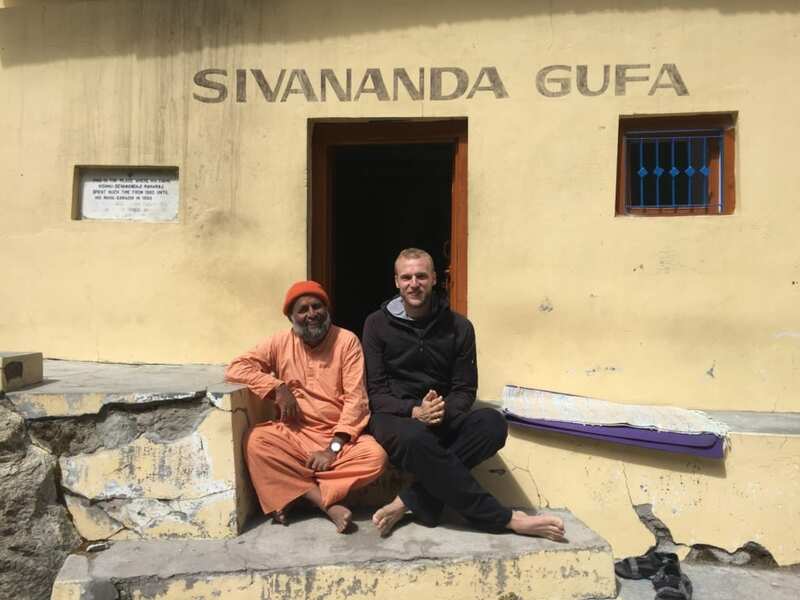 My guru, Swami Govindananda, and I at The Sivananda Gufa, Gangotri, September 2016. I was so lucky to have this experience when I did because the heavy meltwater of the following summer washed most of the cave away. 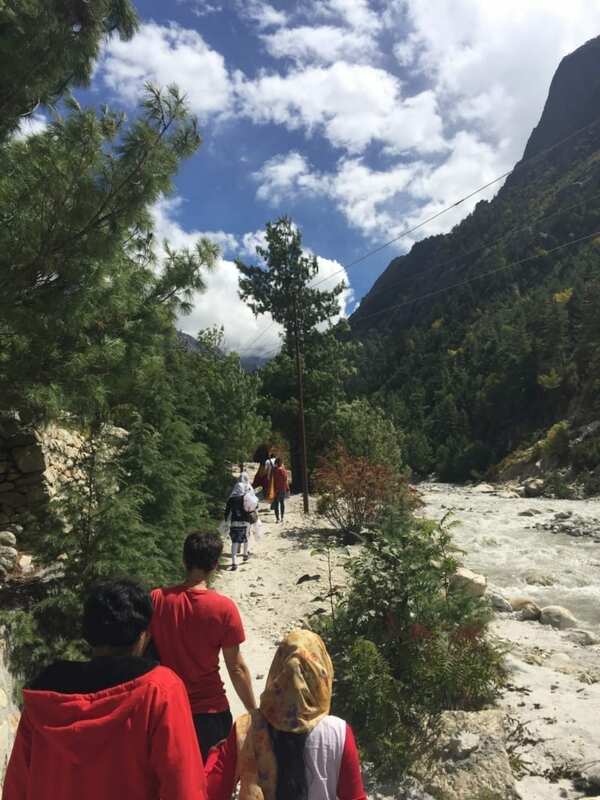 So, I could say that the other lesson I learnt from my time spent in the Himalayas is that nothing can ever remain the same, everything is always in a state of change. And I am reminded not to be attached to what was, only what exists in the present moment, for that is all I truly have. The energetic legacy of Swami Vishnu. * Swami Vishnudevananda was the founder and leader of the International Sivananda Yoga Vedanta Centres. He was the head of this organisation until he left his body in 1993. The Sivananda ashram in Kerala was where my journey truly began in December 2015. 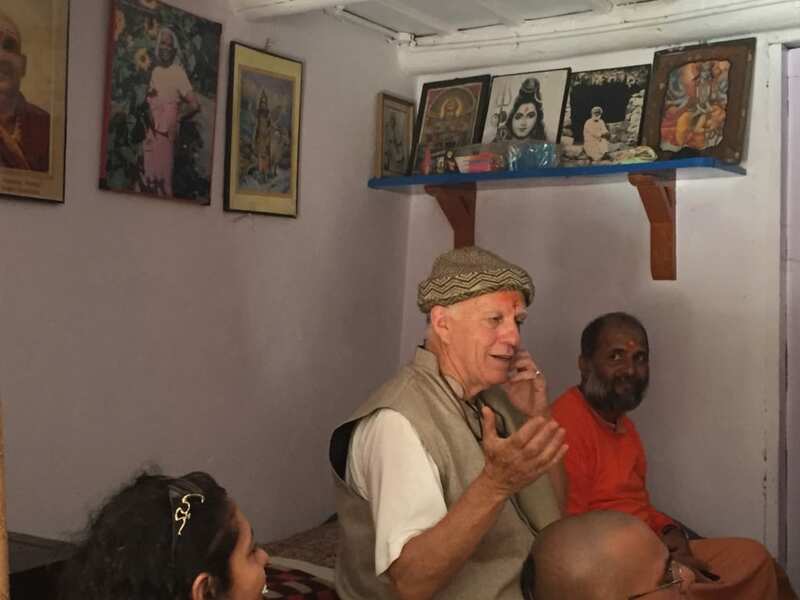 My teacher training in Uttarkashi was with Sivananda Yoga Vidya Peetham, under the expert guidance of my guru, Swami Govindananda (pictured within post).